ATDB • View topic - Athol Hedges to Austral-Denning:a history. Athol Hedges to Austral-Denning:a history. As I had various photographs I wanted to post a topic covering the whole history from Athol Heges through to Austral Denning.Thats every bus and coach made through all of those companies.If you would like to contribute any information,photos,etc here,please do. Throughout the companies history they produced a wide variety of vehicles.They include buses,coaches and even fire trucks.Buses like the Metroliner,coaches like the Tourmaster,DD1,HD1,what would have been the Austral licensed Setra,etc.Their companies were regular advetisers in the Truck & Bus magazines over their history.If you have any exterior and interior photos of any buses and coaches and other vehicles made by the companies please add them here.I'd like to see the changes between all the Starliner,Metroliners,Tourmasters,the Allstar,etc.That includes every variation all these companies made. Did I miss any here? I havent posted about the later A.B Denning company or the current Denning company. It was common practice for the company to build a 12.2 metre version of a single axle bus like the metroliner.There were several of those made.I saw some being operated on tours in Sydney around 1985-86.I would like to see photos of all their bus and coach variations here posted here if you have any. The Tourmaster's front overhang varied depending on the chassis.Mercedes had the longest overhang then in 2nd pace was the MAN's,I think scania and Austral's own chassis were either the same overhang or near enough. Did Austral-Denning have their own chassis? If so was it a combination of the best of both Austral and Denning's respective chassis'? If you have photos please post them here. Did the Tourmaster appear from around 1976 onwards? Maybe we can all contribute where possible. And,I edited this post I started to include identification of each model Tourmaster. You are welcome to contribute anything such as photo,information,memorabillia,etc here.Thanks for stopping by. I would consider this photo to be one of the most beautiful photos of one of the most beautiful looking liveries.Maybe we need to start a post for a competition to see who can post the most beautiful bus or coach photo. Across Australia Coachlines Tourmaster and Olympic East West Express Tourmaster at Caiguna ,WA in December 1985. Another Truck & Bus advert for Domino Industries. Truck & Bus advert for Domino Industries.The "Quest Tours" Coach. Domino single axle coach for "Clipper Tours". Domino 3 axle 11.3 metre coach. Last edited by Denv12 on Thu Sep 21, 2017 5:46 pm, edited 19 times in total. Re: Athol Hedges to Austral-Denning:a history. Austral Metroliner in new livery. Domino Metroliner advert.There were even 40 ft(12m)versions too. Austral/MAN DD1 of Koala Tours. The Bus show display for Austral/Setra Double Deck. Last edited by Denv12 on Thu Mar 13, 2014 2:18 pm, edited 2 times in total. The Domino single axle coach for "Clipper Tours" was TV060 with Clipper. The photograph shows it after sale in May 1985 to Whitecar Coaches in Cairns. Hence the Qld rego plates and QTP plate. Gotta love the Tourmaster!! The screaming GM engines gave them such a gutsy and robust feel to them. Bus_Control wrote: Gotta love the Tourmaster!! The screaming GM engines gave them such a gutsy and robust feel to them. Now you're talking.They were great coaches.Powerful and stable on the road with a nice gutsy engine.The non turbos took some pushing.There's a few of us the forum who love the Tourmasters.Thanks for posting. You are most welcome.These Coaches were amoungst my favourites. Here are 10 pictures of buses and coaches built by Athol Hedges and Domino Hedges.Pictures from the Andrew Potts collection. Last edited by Bedford-29 on Thu Feb 06, 2014 9:59 pm, edited 1 time in total. Great collection you have there.Thank you for sharing.What year did the Deluxe book come out? I never knew of that one. I loved these Tourmasters.Love the photo.Thanks for helping here. "It was later renamed....Domino before becoming Austral in 1982 when purchased by the Australian Manufacturing Group. It originally bodied buses diversifying into integral buses and coaches (body and chassis) in the 1970s. In December 1988 Austral was sold to Jaguar Rover Australia who also owned Denning, Austral's largest rival in the coach market. Both continued to operate separately until 1990 when the Denning plant in Acacia Ridge was closed and production transferred to the Austral factory. From 1992, the combined business was rebranded as Austral Denning. In July 1996, along with Jaguar Rover Australia's other bus bodybuilding operations, it was sold to the Clifford Corporation and rebranded Austral Pacific. This resulted in Ansair Orana Volvo B10BLE buses being bodied at Geebung for Brisbane Transport. Following the collapse of Clifford Corporation, the plant closed in November 1998." 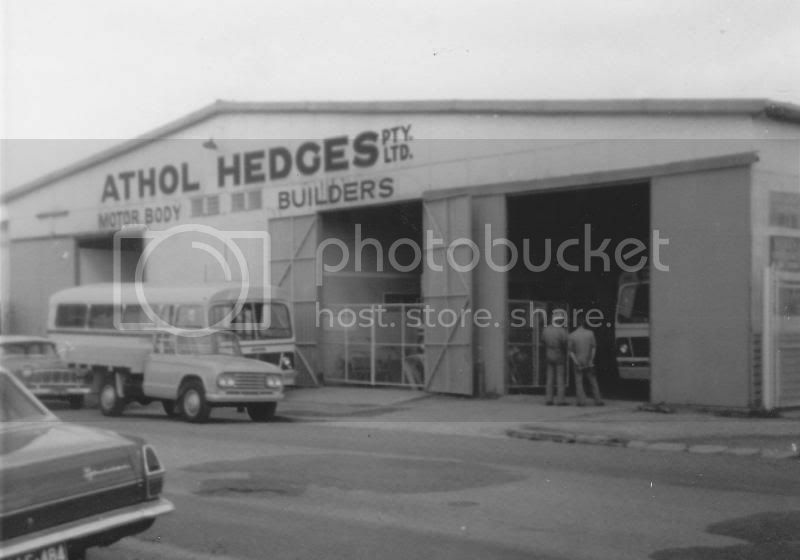 Hi system improver.Love the photo.Some history there.We need more history on this forum.If you have photos for comparison between Comeng built buses and Athol Hedges built buses where they look similar. Something else I remembered.I found a letter from Austral. As for the photo further down showing to Tourmasters at a Roadhouse,where was that photo taken? It looks like a morning photo somewhere on the Nullabor. Last edited by Denv12 on Fri Feb 07, 2014 6:32 am, edited 1 time in total. looks to be the same workshop premises in later years...? Do you have the address for viewing on Google Earth? dominodc122 wrote: Do you have the address for viewing on Google Earth? If you click on my link, you should be able to get it. Either that, or punch in 343 Melton Road Northgate into Google, and follow the prompts. I like Bedford-29's shot of that Canberra bus; that early "Yellow Fire" livery as shown on said bus looks quite good. I think it might have been one of those buses ACTION bought during the '74 bus shortage-correct me if I am wrong. ACT Bus wiki say Action 226 a Ford R192 was a stock unit purchase from Athol at the time of the Action 1974 bus shortage.226 had the Ford 300 I6 engine coupled to a 5 speed synchromesh gearbox.226 was withdrawn in 1976. I remember going to Northgate to pick up some wiper parts for the BCC 1979/80 Bedford in 1983 or 4. I'm sure the parts dept was then on Nudgee Rd. Around 1997 the Austral Pacific Group, Geebung plant were rectifiing all the body complaints of the 20 MAN 10.155/Ansair Orana assembled at Tamworth and Melbourne plus building the first Volvo B10L/ Ansair Orana body for BCC and the Volvo B10BLE/Ansair Orana for STA. At least that is the year I remember going to all the meetings at their plant. When I was on the Volvo side of things delivering B10Ms to Austral Geebung back around 1990, (Oh bugger, what happened to all those years before and after?) I remember seeing about 7 Setras lined up on the grass opposite the factory office, all painted nicely in Dulux colors waiting for an owner who wanted them. We submit our quotation for the supply of twenty (20) Bus Bodies complete, fitted to Leyland Chassis. Our price for the fabrication, fitting out and finishing of 20 Bus Bodies in accordance with Brisbane City Council specification T1-1967/68 is a sum of $188,000 ($9,400 price per body). The price per body would be $9,225. Ansair of Essenden Airport, North Essenden, Victoria quote $10,125 and Freighters Limited of Warrigal Rd Moorabbin, Victoria. quote $10,329. Could someone tell what sought of chassis is under this Athol bodied bus that was owned by Walker`s Bendigo its rear engine maybe GM powered as I am curious to know.Picture from the Andrew Potts collection. Wow, I thought Athol Hedges did his time with Mr C. Hope. In Charles Hopes autobiography he states he had some apprentices come through who had gone on to building their own successful businesses, one being George Lester of MBS, I'll ask his son again tomorrow about details. Last edited by Maladjusted on Sun Feb 16, 2014 5:10 pm, edited 1 time in total.